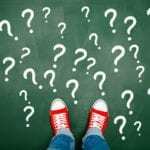 Why I won’t read your email (or, why you shouldn’t buy email lists) – Sundin Associates, Inc. Cold emails have become so accepted, that for the most part I don’t bother unsubscribing or marking as spam. Instead, I thoughtlessly delete, rarely reading more than the headline or from address to ensure it’s not something I need to care about. 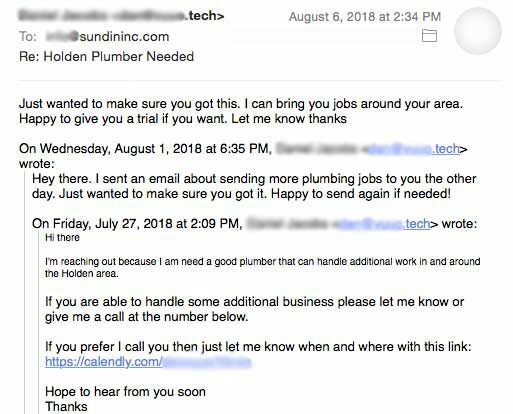 And then we started receiving plumbing emails, like this one, asking if we could accomodate more plumbing work. 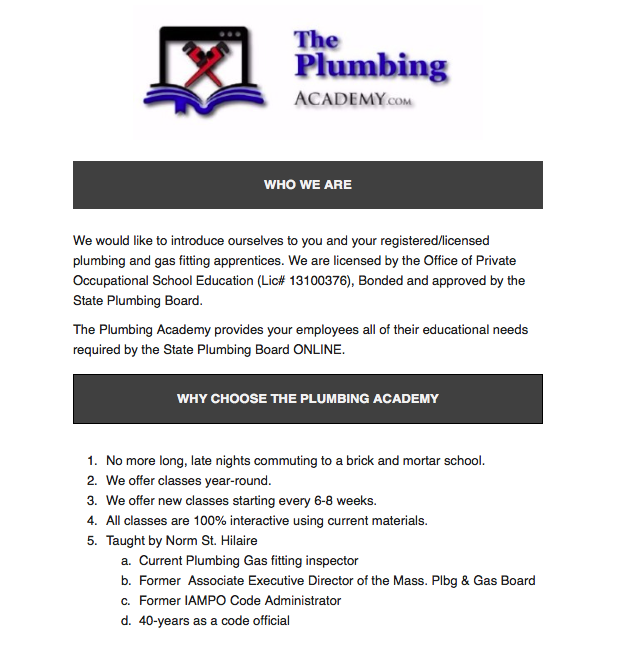 And this one from The Plumbing Academy, inviting us to take advantage of educational opportunities. So let’s look at what is probably going on – B.A. Sundin & Son – a builder in Holden, ended up on an email list using our info@ address. I presume, since the email is incorrect, that they didn’t sign up for this list, but instead were added by someone (or something) scraping up emails. 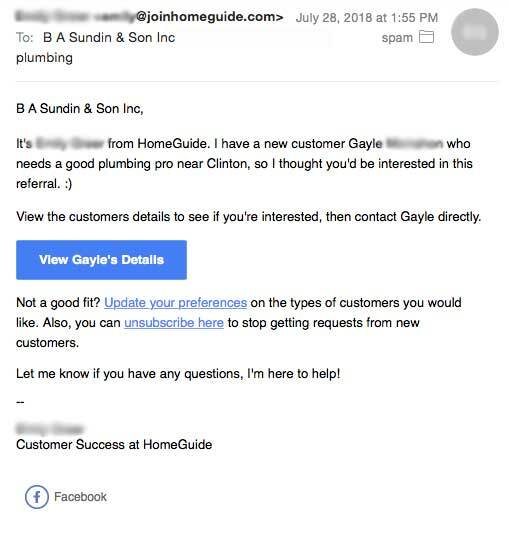 This list was then bought by other organizations, which are now using it to bother us with plumbing-related solicitations – including an invitation by HomeGuide to update our preferences to ensure better referrals. Weird. I don’t see advertising or marketing on this list. My team and I often find ourselves in the awkward position of trying to explain why we, and the partners we work with, do not use purchased email addresses. While it may feel like “everyone is doing it,” the fact remains that it is a violation of CAN-SPAM. But more importantly. . . it doesn’t work. I could tell you it’s because your subject line isn’t engaging enough, your content isn’t useful enough, your offer isn’t compelling enough, your layout isn’t beautiful enough, or your call to action isn’t inviting enough. 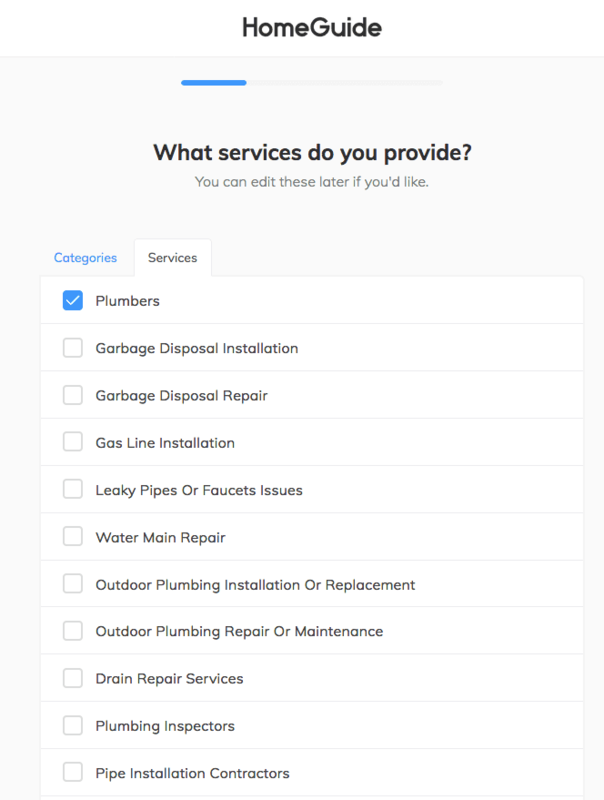 Assuming the list is any good, which if my plumbing experience hopefully shows you, it can often be garbage, the real issue is. . . no one asked for your email. We have laws regarding the proper use of email because email is an essential tool that is getting flooded with unsolicited spam, costing each of us time (and money). Even if you had something good to say, or to offer, it gets lost in the chaos, shuffled off to the offers folder, or blocked by spam filter. 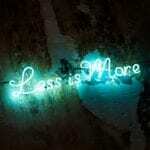 Does that mean you shouldn’t use email at all for marketing? Of course not! Email marketing can be an effective way to connect with and cross-sell to, current customers through your own, legal and clean, list. It can also be a great way to connect with prospects through lists they have subscribed to, for example, sending an offer through partners such as your local chamber of commerce. It just needs to be used more thoughtfully. And legally.